Congratulations to the Department of Medicine doctors who have been awarded the “Best Doctors” title by their peers. 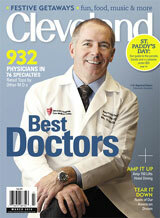 The Department of Medicine would like to congratulate our doctors who have been recognised in Cleveland Magazine’s “Best Doctors” list. We want to thank the entire community of CWRUmedicine physicians, nurses and staff for the work they do every day.